That sneaky little crafting bug snuck up on me and nipped me! I just had to make this canvas art I saw at Scruggbug Corner. Herchel made this gorgeous canvas wall art and I knew I just had to do something too. Here is her canvas. Can you say adorbs!! I totally fell in love with it and off to Hobby Lobby I went Saturday. I did not find her stencil and I searched all over the store. I did, however, find this stencil with a bird in the tree. 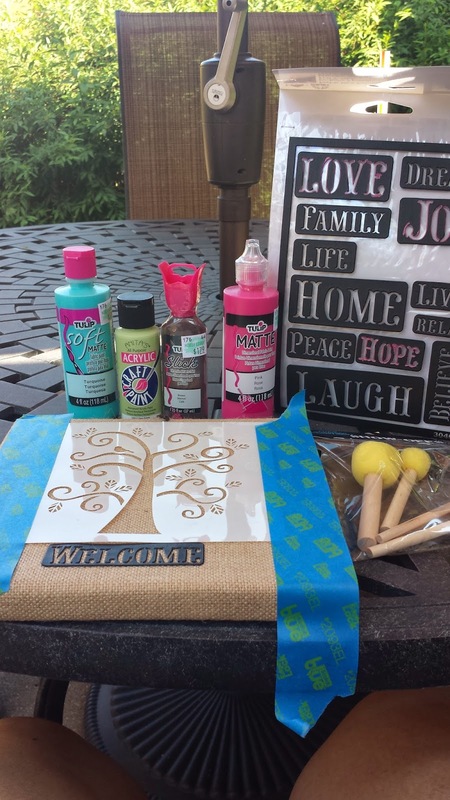 In my searches I found an 8 X 8 burlap canvas and then chose my colors, which is the hardest part for me, let me tell you! It was such a nice morning, that I decided to set up shop outside on the patio with my Westie at my feet. I started by putting down my stencil and taped it so it wouldn't move. I did not measure it, just eyeballed it. I felt it needed a little something something so I added the word "welcome" to the bottom because I thought it would look great on the wall by the front door. 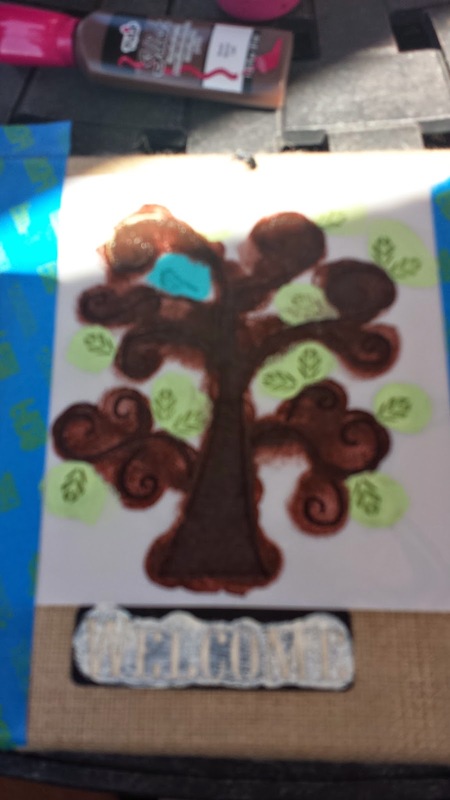 I started with the brown tree trunk, then the green leaves and welcome in cream. Finishing it off with a pop of a turquoise bird. The tree limbs were super small so I had to use a really small stencil dauber. I think I could have used an even smaller one! Once it dried and I took off the stencil, it just needed a little extra. 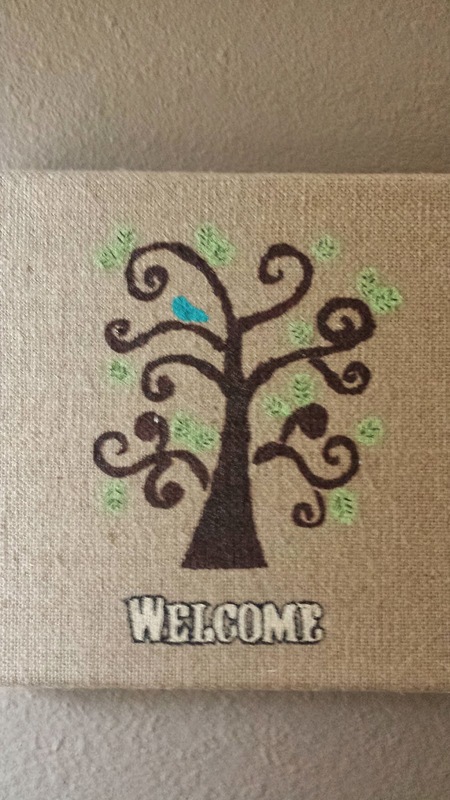 The little leaves didn't come out the way the stencil had it (I was probably heavy handed with the paint because I wanted to make sure the burlap took the color), so I got out my handy dandy black Eco pen size .45 and outlined the word "welcome" and added the lines in the leaves. 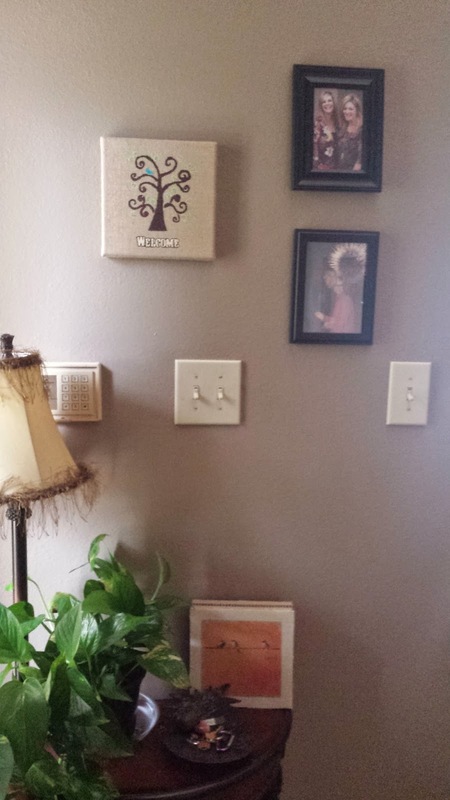 I finished it off by hanging it in the front entry way with my pictures of myself with LT and my sister D. I think it turned out pretty good for a first time. I am happy with it and in the end that is what matters. I know as I keep trying, I will be getting better. I was just so happy to be breaking out of my box and attempting something new. There is just something amazing that happens when you make something yourself. It is almost a euphoric high. I hope you all get to experience it sometime. My next projects will be with things I am partial to like birds, trees, Westies and monkeys. 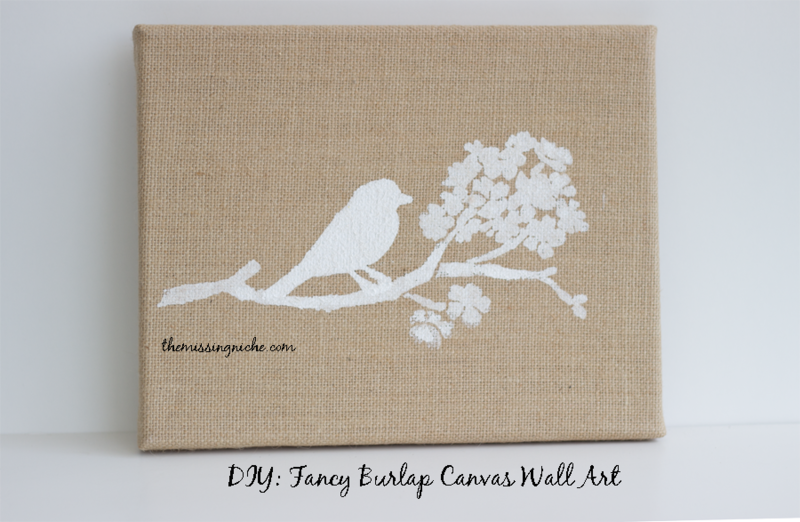 So tell me…what would be your canvas art?